Those who are up to date on CW's Arrow know that Barry Allen -- a.k.a. the eventual Flash -- had been hitting it off with the lovely Felicity Smoak during his visits to Starling. But as there's been no word of Felicity making any kind of permanent departure from Starling to Central City (Olicity fans' heads might explode if that were the case) it's probably safe to assume things aren't meant to last between those two, especially assuming the Flash pilot goes to series. So that leaves an opening for a love interest in the mentioned spinoff, and it appears that's been filled by the lovely Candice Patton, who ha sheen cast to play Iris West. Those familiar with the comics know that Iris is Barry Allen's eventual wife, however there's no telling whether or not the potential Flash series intends on following that particular arc. However, THR does say that the character becomes a love interest for Barry. She's also a grad student who is Barry's quick-witted best friend and the daughter of Jesse L. Martin's Detective West. 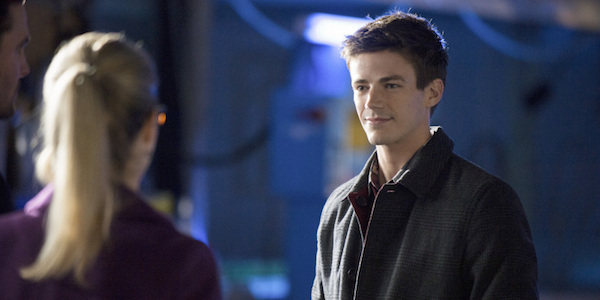 Spoilers ahead about Barry Allen if you're not caught up on Arrow! Grant Gustin has already appeared on Arrow a couple of times as Barry Allen, introducing the character that will be at the center of the Flash spinoff. At present, Barry Allen is still in a coma after the lightning storm that affected Central City. From what we know, Felicity is still concerned for Barry's wellbeing enough to visit him in the hospital. It seems likely that the arc between Felicity and Barry will be resolved and presumably concluded, as I can't see them having a long-distance relationship that crossed over between Arrow and Flash on a regular basis. That is, assuming Flash goes to series, which it hopefully will. In which case, it seems like Iris is the potential long-term love interest for the character. And that's just as well, as it sounds like Barry has a close connection with Jesse L. Martin's Detective West, both on a professional and personal level. Candice Patton's credits include the role of Tori on The Game, as well as appearances in Rizzoli & Isles, CSI: Miami, Harry's Law and Grey's Anatomy. In Flash, she joins Gustin, Martin and the recently cast Rick Cosnett and Danielle Panabaker. CW will likely determine the fate of this drama by the Spring up fronts, if not sooner. Given how long we've known about the drama, we'll hopefully be hearing good news about its future in the near future. We'll keep you posted. In the meantime, check out the preview for tomorrow night's Arrow here.